Naya Kang(5884m) lies in Langtang Region. This peak is easily accessible for any climbers. Naya kang is technically difficult peak but it is not require and experience or climbing skills. 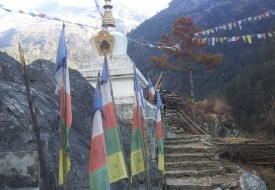 We drive to Shyabrubesi(1450m) and continue fallow the Langtang trek Itinerary. We walk through the dense alpine forest like Birch, Fir, Pine, and Rhododendron forest. This region is very popular for flora and fauna and Chances to see some protected Animal in Nepal. Like as Rhesus, Musk Dear, Red panda, Black beer, snow leopard and many others animals. While we reach into the Kayanjin Gompa and we have a acclimatize day and next day we climb to thye high camp and get to the summit than we can back to Kayanjin gompa or you can continue trek to Gonja la pass and Helambu trek. You have great panoramic views of the Mountain from the Top of Naya Kang(5884m) where you can see the langtang Lirung, Langtang Ri, Ganesh Himal range, Sisapangma, Dorje Lakpa and many other snow cap mountain around this valley. Day 12 : Trek back to Kyanjin Gompa.